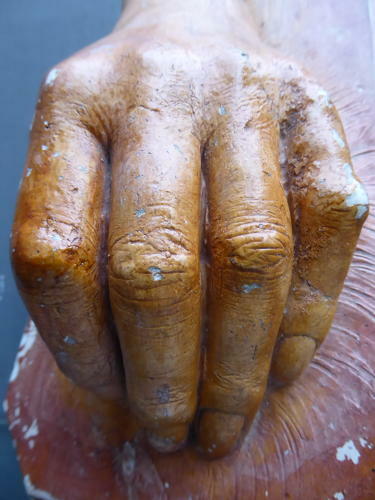 A wonderful example of an early plaster anatomical hand. A beautifully well made if slightly macabre piece, cast in solid plaster & finished in its original two-tone paintwork with amazing detail & a good age related patina. Dated & bearing a signature to the wrist area which is believed to be that of D Brucciani who specialised in anatomical plaster casts of classical sculptures, bronzes and other pieces during the 19th & 20th century. A great piece for the cusiosity cabinet! Wear commensurate with age, good condition overall with expected wear to the paintwork & light chipping.